Osmosis is changing the way skin conditions are treated using revolutionary, all natural, organic and paraben free formulas. Ben Johnson MD, the founder and formulator of this line, combined his holistic approach to the skin with his medical training to create a line that is free of all harsh, artificial ingredients while using several of the most research-proven ingredients in the industry. 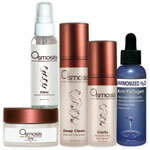 Osmosis is the latest anti-aging skincare avalaible on the market today! Using highest dose of anti-oxidants to assist the stimulation of collagen and elastin and to smooth out fine lines. Osmosis can help lighten pigmentation and hydrate the skin back to a healthy plump youthful glow!